The rivalry between Real Madrid and Barcelona is at its peak right now. As the Catalans are increasing their dominance in domestic and European competitions, Madrid is bent upon saving its reputation as the best club in Spain. In the past two years, Real Madrid, under Florentino Perez, adopted a policy of countering the Barcelona squad. Therefore, with Pep Guardiola in charge of affairs in Catalonia, the ‘Special One’ Jose Mourinho was hired by Madrid. Also, in order to counter the presence of Lionel Messi, Cristiano Ronaldo was signed on. Ronaldo was the winner of the FIFA World Player of the Year award (2008) in the year before Messi won his first award. 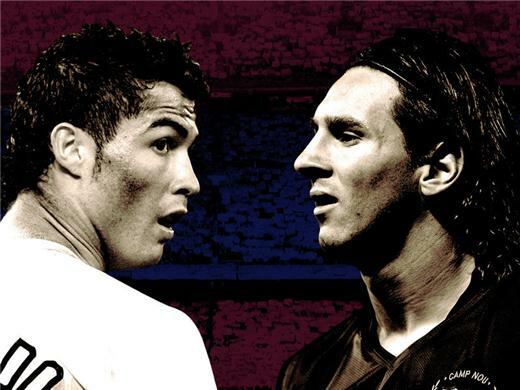 Ever since Ronaldo joined Madrid, the rivalry between Messi and him has also flourished and is being closely watched. Ronaldo has a passion for becoming the best player of this age as he has often pointed this out in his statements. Even after Messi won the award in the year following Ronaldo’s achievement, the Portuguese forward regarded himself as the best in the world. However, the Argentinean maestro won the award last year as well despite the fact that he was the least probable person in the final shortlist. Also, for the first time in the last four years, Ronaldo failed to make it in the final three, but he retained his position in the World XI. In the past two years, Ronaldo and Messi are constantly improving their game. Both players have a better fitness level as they remain available for most of the action. This is a clear sign that the presence of a worthy opponent keeps both the players occupied and pushes them to work harder. Even in the El Clasico played last November, the rivalry between Ronaldo and Messi overshadowed the rivalry between the two clubs. This season, Ronaldo and Messi are topping the scoring charts once again and the competition is going to heat up in the next part of the season. Ronaldo has a small lead over the Argentinean in the league but Messi leads the charts in Copa del Rey and Champions League. Messi claims the overall advantage on the basis of an incredible 14 assists in the league. Therefore, at this moment Ronaldo is lagging behind in this rivalry but there is still some way to go. At one point, it seemed as if Ronaldo was obsessed with Lionel Messi and was jealous of the success he has been getting. However, the Madrid forward said that he was not envious of Lionel Messi; he only wants to be the best player in football. "I do not have an obsession or a direct rivalry with him, it is the same that I feel about other players. One thing is certain, however, I want to be the best of all. I feel no envy at all towards Messi. My priority is to win the Spanish title and the Champions League with Real Madrid, and not Ballons d'Or,” he said to reporters. One thing is certain: Ronaldo wants to be the best and all his life he has worked hard in order to achieve that goal. However, the hard working Portuguese forward has to face a real challenge in the shape of Lionel Messi, who is certainly more gifted as a footballer. Being a South American has also played in Messi’s favour because it gives him some extra talents like dribbling and creative skills, which is not very common in European players. Therefore, if Ronaldo is obsessed with being the best in the world, he is indirectly obsessed with Messi, but it is not a direct rivalry as pointed out by Ronaldo. One thing is for sure that both players are unique in their own way. However, Messi does get some help from the quality present around him in Barcelona’s squad, which is better than the support given to Ronaldo in Madrid. Messi is a little ahead of his rival but Ronaldo is doing the right thing to keep his focus on the real aim of winning trophies.